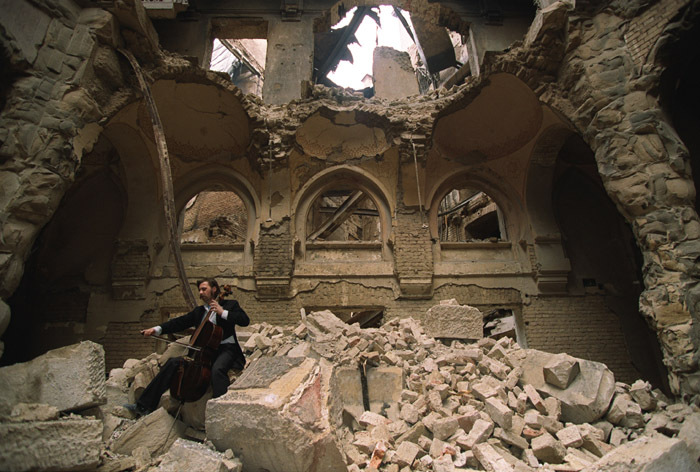 The Cellist of Sarajevo was inspired by events during the siege of Sarajevo in the 1990s. When a mortar round kills twenty-two people waiting in line for bread, a cellist in the symphony orchestra engages in an act of defiance against the perpetrators: he vows to play Albinoni’s Adagio in G minor every day for 22 days to honor the victims. 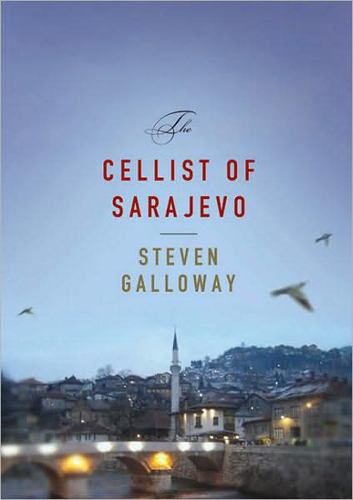 This moment sets the backdrop for a novel in which Galloway weaves the primary stories of three people living in Sarajevo at the time of the siege. Arrow is a woman whose decision to accept an assignment as a sniper killing soldiers starts to change her in numerous ways, questioning her ultimate humanity. Kegan is a young family man whose frequent trips to gather clean water for his family puts him in harm’s way on a regular basis. Degan is an older man with a wife and child who moved to Italy before the city was closed off. He encounters an old friend who forces him to question his life before the war. The stories of all three characters come together to produce a haunting book about the human spirit, how war changes people, and how people can endure horrendous circumstances by finding meaning in the small things. This was a wonderful book that was both sad and uplifting. The writing style was fairly sparse but appropriate for the themes and subject matter. Often, books that highlight the triumph of the human spirit can be overly saccharin and unrealistic. However, Galloway’s skill in creating a complex and realistic portrait of human nature is impressive. He doesn’t gloss over the struggle. Violence is visible and at the forefront of this novel. Corruption is described and accepted as part of the situation on both sides of the conflict. The central characters have moments of weakness and cowardice in addition to moments of strength and courage. You can learn more about Smailovic here. The Cellist of Sarajevo does not pretend to be either a biography or a piece of non-fiction. Galloway clearly writes in the preface that the book was inspired by Smailovic but that it is a fictional story. I highly recommend this book. It was a powerful and emotionally-evocative book. I read this a few years back for my F2F book club. It was an intensely personal story for me – made vivid by my own experiences in that city. My husband spent six months in Sarajevo as a consultant with US A.I.D. I spent three weeks with him there. We were housed in the apartment building mentioned in this book … “The parrot” – it really is bright green and bright yellow … and there were still bullet holes in the window frames of our apartment. Our view was across the river and to our right we could see the bombed /destroyed library (photo of the cellist playing in the ruins is in this original post). We crossed the bridges in the novel every day … the one where the character has to cross on just the beams, was the main bridge closets to our apartment and the one we used most often (of course, it had been rebuilt when we were there). Somewhere in this house I still have one of the postcards showing the cellist playing in the ruins of the library. I actually find that one photo more powerful than the whole book.